For many modern Pagans, one of the most popular and often-used tools is the cauldron. You may have chosen a small table-top sized one, a large one that sits in your back yard, or something in between. Whichever size you use, if it’s a cast iron one, it’s not a bad idea to season it. 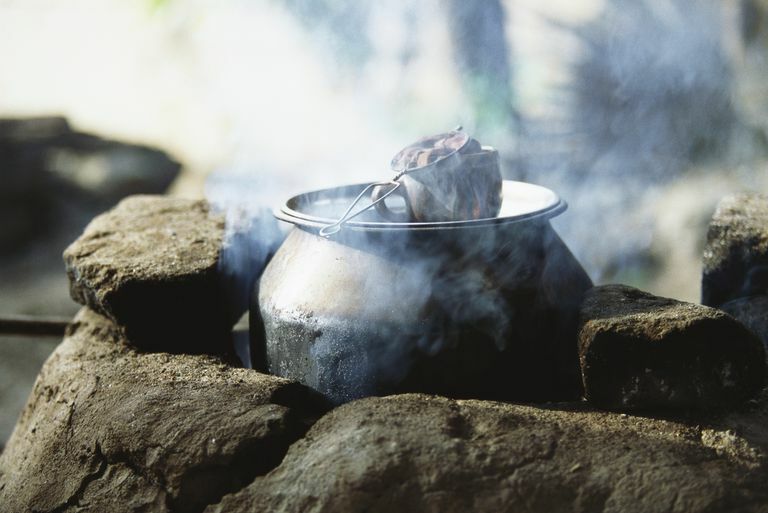 Seasoning a cauldron has two purposes, both of which can be important for magical workings. Why Use a Cauldron in Witchcraft? Traditionally, the cauldron has been a place where those who practice witchcraft blend potions and brews. This is due in part to its popularity in fiction, in which ordinary cooking vessels were touted as tools of the practical witch. Think, for instance, of the three witches in the opening scene of MacBeth, chanting Double, double, toil and trouble, fire burn and cauldron bubble. The cauldron also appears in mythology as an item of magic and mystery. In Celtic legend, the cauldron is associated with wisdom, and the goddess Cerrdwen, who kept the cauldron of knowledge. Supposedly, in Ireland, the pot of gold kept by leprechauns isn't just any old pot–it's a cauldron. For modern practitioners, there's still a lot of magic to be made in a cast-iron cauldron. You can use it blend herbs, burn incense, mix up a batch of black salt, or place names or petitions to deity inside. Regardless of how you choose to use it, you're going to want to season it. The first thing that seasoning accomplishes is it prevents rust. If your cauldron is used outdoors, or if you use it to hold liquids, this is crucial. The seasoning process will help you get years–and yes, even decades–of use from your cast iron cauldron. The second reason for seasoning a cauldron may or may not apply to you. The seasoning creates a natural nonstick surface inside the cauldron. If you cook in your cauldron or use it to hold hot things–charcoal discs with incense, for instance–this will extend the life of your cauldron and make it a whole lot easier to keep clean. Keep in mind that the following method of seasoning can be used on any cast iron vessel, such as a skillet or pan, and not just your cauldron. Before you begin the seasoning process–and yes, it IS a process, and takes some time to develop that shiny black surface we all want to see–be sure to wash your cauldron with soap and water. Most experts say that this first time is the only time you should use soap in your cast iron. Once you’ve washed it, rinse it thoroughly and dry it completely. Coat your cauldron with a very thin layer of cooking oil, both on the inside and out. If your cauldron has a lid, cover that too. The best results generally come from vegetable oil or even Crisco-type shortenings. You can apply the oil by pouring a small amount on a cloth or towel and rubbing it onto the surface so it’s evenly coated. Heat your oven to a low to moderate temperature; usually between 300 and 375 is plenty, depending on how accurate your oven’s temperature is. Put a tray at the bottom of the oven to catch any oil that might drip down there. Place your cauldron in the oven, and let it bake for an hour or so (some people like to place theirs upside down, so try that if you like). If you’re doing the lid too, place the lid on the rack next to the cauldron, rather than on top of it. A closed cauldron will not season as well. After an hour, turn the oven off but don’t remove the cauldron–you’ll burn yourself! Let the cauldron cool off on its own before you remove it. To continue the seasoning process, each time you use your cauldron, simply clean it out with hot water. If there’s something baked onto the surface that you can’t get off, like bits of charcoal, candle wax or incense residue, use a stiff brush to remove it. Some people hold to the idea that you should never use soap in a cast iron pot or skillet, so if you prefer, just clean it out while it's still hot. However, other people feel that the "no soap in your cast iron" warning is a bit of misinformation, and claim to use soap in their cast iron successfully; if you want to give it a shot, go ahead if you like. After you’ve washed it out, coat the inside once more with a thin layer of oil, and wipe it out with a paper towel. You can also heat it on a burner, then add a light coating of oil. Remember, don’t ever put your cast iron ANYTHING in a dishwasher! By seasoning your cauldron, you’ll extend its life span and usability. You’ll end up with a well seasoned cauldron that you can pass on to future generations of Pagans. Once you've seasoned it, be sure to consecrate your cauldron like you would any other magical tool for use in ritual. How Long Do I Have to Wait for a Magic Spell to Work?